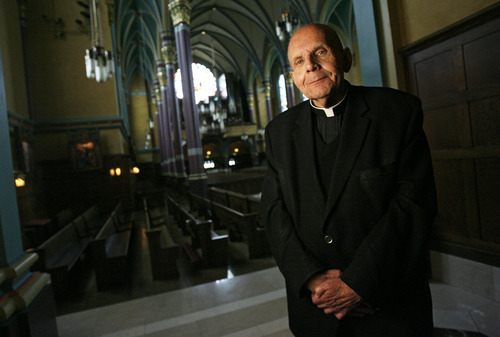 The go-to priest • Fitzgerald retiring after decades of straight-talking, problem-solving, people-loving service. After decades of service, much of it behind the scenes, the witty Monsignor J. Terrence Fitzgerald is seen as the go-to priest. 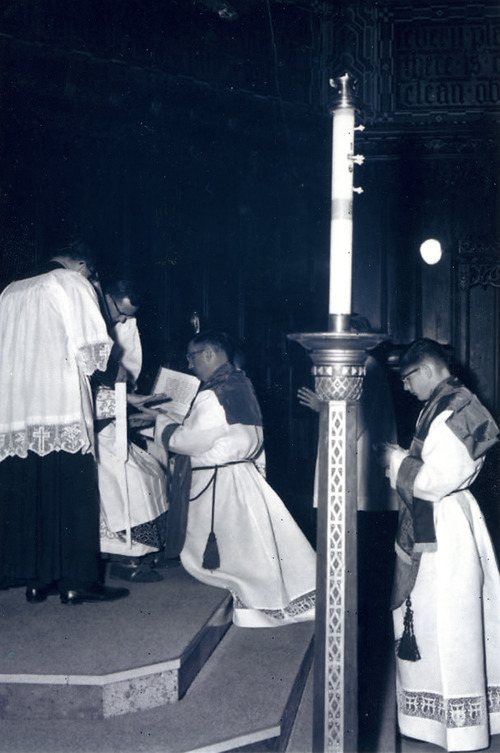 Tribune file photo Monsignor J. Terrence Fitzgerald is ordained May 12, 1962, at the Cathedral of the Madeleine. 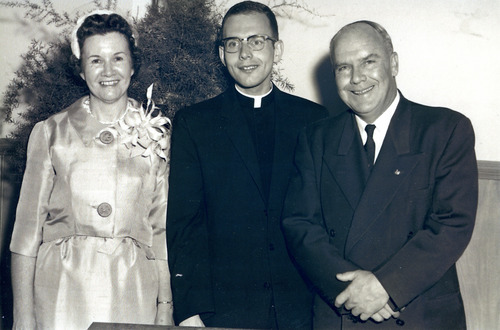 Fitzgerald, center, with his Irish Catholic parents, Margaret and Joseph Fitzgerald. Francisco Kjolseth | The Salt Lake Tribune Monsignor J. Terrence Fitzgerald talks about his years of service on Tuesday, May 10, 2011. Francisco Kjolseth | The Salt Lake Tribune Monsignor J. Terrence Fitzgerald, pictured at the Cathedral of the Madeleine, where he was baptized 74 years ago and later ordained in 1962, is retiring next month as vicar general. Monsignor J. Terrence Fitzgerald could have been a bishop. His Catholic credentials were impeccable, his administrative skills extraordinary and his pastoral training deep and wide-reaching. Plus, he graduated from seminary in the Class of 1962, holding his own alongside several classmates who would became future bishops. Still, the Utah-born dynamo  vicar general for nearly two decades to 300,000 Utah Catholics in Salt Lake City's Diocese  preferred to work his magic behind the crosier, accepting every new assignment his leaders handed out with vigor, optimism and that wry little smile that always preceded one of his witty zingers. Study social work at Catholic University as preparation to supervise the church's social-service wing? Off he went. Take over parochial schools in Carbon County, Judge Memorial High in east Salt Lake City or Mount Angel Seminary in Oregon? No problem. Persuade more young men to join the priesthood? Will do. Find property for a new church in Park City? Check. Talk Sam Skaggs into donating land for a new Catholic school campus and then oversee the multimillion-dollar project to completion? Done. For the past four decades, the self-effacing Fitzgerald has been a "consummate problem solver," observers say, managing many ministries and services with finesse and aplomb, while gaining respect from inside and outside the church community. At long last, his contributions will be publicly heralded Sunday during a 2 p.m. Mass at St. Anne Catholic Church, 450 E. 2100 South. He will formally retire June 4. "Anything I needed fixing, he could do it  and quickly," says retired Bishop William Weigand, of Sacramento, Calif., the second of four Utah bishops Fitzgerald served under. "I wonder: How will they survive without him?" Both pairs of Fitzgerald's grandparents were Irish immigrants who came to the American West to work in the mines, including one in Park City. Young Terry, as he was called, was reared an only child in Sugar House, but his mother, Margaret O'Connor Fitzgerald, had 12 brothers and sisters, putting her son at the center of a large and devoted Irish Catholic clan. "Church was very, very important to us," the 74-year-old Fitzgerald recalls. "Faith was part of our everyday life." Fitzgerald got his education at the hands of nuns and priests at Judge Memorial Grammar School and High School, moving from year to year with the same 52 students. It was a welcoming Catholic cocoon, incubating many of Utah's future priests and lay leaders. The eager student, who revered the men who taught and mentored him, never considered any other profession. The next step was to leave the Beehive State for Mount Angel Seminary in St. Benedict, Ore., for a college degree and rigorous training as a "churchman." There, he studied literature and philosophy, Latin and liturgy, as well as how to preach, baptize, celebrate the Eucharist, perform marriages, hear confessions, and administer last rites. On May 12, 1962, Fitzgerald was ordained a priest by Bishop Joseph Lennox Federal at Salt Lake City's Cathedral of the Madeleine, the same sacred space where he was baptized. Four months later, Pope John XXIII convened Vatican II, a worldwide gathering of Catholic leaders that erupted in the centuries-old church like a theological volcano. Latin was supplanted by "mother tongues" of the faithful, and the altar was turned around so priests faced the people. Laymen assisted in worship, while the church embraced more folksy music and interfaith dialogue. "It was a change from the very formal structure to a freer one," Fitzgerald says. "We lost a number of good priests  it was the most shocking exodus I had ever seen  but we kept a lot of good priests." Although some Catholics had trouble with the new direction, the ever-adaptable Fitzgerald simply changed with it. On his return to Utah, Federal sent Fitzgerald to Catholic University in Washington, D.C., to earn a degree in social work, with the idea that he would use those skills to help the Utah church's humanitarian efforts. In the nation's capital, the new priest encountered homeless, racial and welfare issues for the first time. The diocese called him back a year later to complete his degree at the University of Utah so he could minister to the young Catholics at the Newman Center, adjacent to the campus. "I was not used to the wine, women and music I heard every night," Fitzgerald quips. And so it went throughout his career, moving from one trouble-shooting assignment to the next. A school system in Price. A parish in Tooele. Catholic schools. Religious education. Ministering to the clergy. Back to Oregon to head the seminary from which he graduated. Finally, in 1993, Fitzgerald was asked to head Utah's Catholic Community Services, where his diverse experiences and deep compassion paid off. 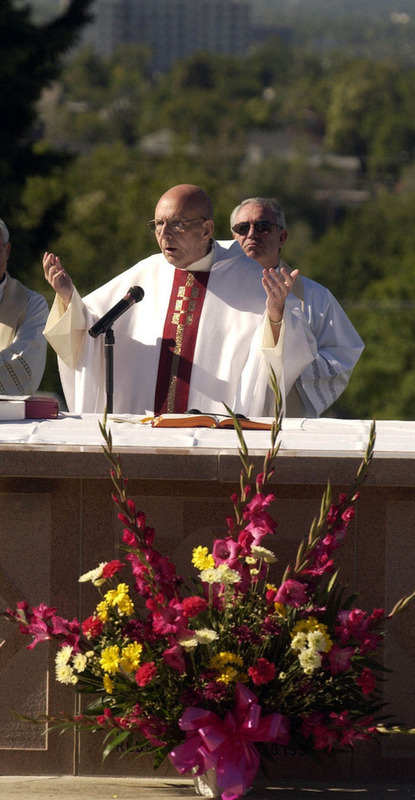 He regularly visited St. Joseph Villa, a longtime Catholic care center in South Salt Lake, ministering to retired priests, parishioners, even people who didn't want to be there. When one very ill resident insisted on going home, the gentle monsignor disarmingly told her that the freeway was torn up, so why not just get an ice cream cone instead and think about leaving tomorrow? Maggie St. Claire, Fitzgerald's replacement at Catholic Community Services, says the priest supported her even when he disagreed with her decision. She came to see how important the church's humanitarian mission was to him personally. "He does not see the 'poor among us' as abstractions," St. Claire says, "but as fellow human beings deserving of our love and support." If people need tuition or rent money, Fitzgerald just gets out his checkbook. "Terry lives a simple life," the diocese's current bishop, John Wester, says. "Anything he has in excess he gives away, saying, 'I'm a priest. Why do I need money?' "
Streams of people steadily drop by to see Fitzgerald  everyone from a member of the governor's staff to a recently paroled convict, Wester says. "His door is open to princes and paupers and everybody in between." That includes believers of all faiths as well. During his decades in the diocese, Fitzgerald has watched and participated in a growing alliance between Mormons and Catholics. In the 1960s and '70s, neither church allowed a public show of support for the other, while behind closed doors friendships flourished. Fitzgerald developed a close bond with the late apostle James E. Faust, who rose to the LDS First Presidency. Faust, who once did legal work for the diocese, would often stroll by the chancery late at night, see Fitzgerald's light on and throw rocks at the window to get his attention. The Mormon lawyer joked that he could never be a Catholic "because you work too hard," Fitzgerald remembers with a smile. "I told him, 'But if you were a Catholic, you wouldn't have to tithe.' "
Through the years, the two churches' relationship became more and more public, working on joint projects, attending each other's special events and reveling in each other's successes. On the April 2008 Saturday when Thomas S. Monson was sustained as LDS president, Fitzgerald took some newly ordained priests to lunch at Little America in downtown Salt Lake City. As they were eating, a hand reached over the side of the booth to tap the monsignor on the shoulder  it was Monson. "My goodness, President Monson, what are you doing here?" Fitzgerald asked, then proceeded to chat with the Mormon prophet, a longtime friend. His Catholic associates were astonished and impressed by the ease between the two. Monson, in a statement this week, praised Fitzgerald's "many years of dedicated, Christ-like service he has provided" and noted the monsignor's "tireless efforts to serve." Fitzgerald's own response to such plaudits? 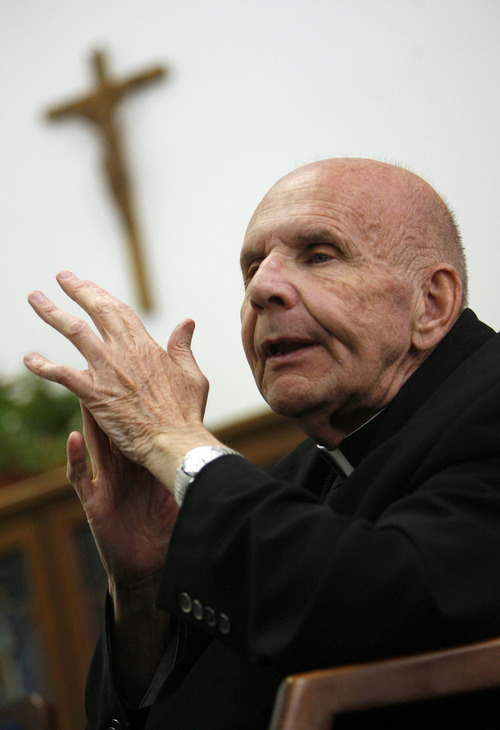 All it takes to be a monsignor, he jokingly said at a recent retirement dinner, "is never to have been in jail." Although Fitzgerald was shocked and saddened by the magnitude of allegations about priestly sexual abuse that surfaced in 2002, he felt relieved that the Salt Lake City diocese already had in place standards of reporting. "We never had leadership that covered up abuse," he said, "or transferred priests with problems." And when the U.S. Conference of Catholic Bishops put in place its Charter for the Protection of Children and Young People, Utah's vicar general made certain they were followed to the letter, says Rosemary Baron, chairwoman of Utah's committee on abuse. "He made sure we were on track with everything that needed to be done." Fitzgerald has met with every abuse victim, Baron said. "He cared for them, counseled them and nurtured them." Although the vicar general  who essentially acts as the bishop's top deputy  is a straight-talking leader, he has kept the respect of Utah's 70 priests throughout his tenure. Having to move a priest who wants to stay put or admonish one who needs to improve, Fitzgerald doesn't mince words, Weigand says, but he "can pull it off without alienating the priest." Virginia Albo, a Catholic volunteer who has known Fitzgerald for about 50 years, knows the secret of his directness. "He asks you to do something you don't think you are capable of doing and then makes you think you can," she says. "He has faith in people." It's also in his approach to deity. "When he speaks of his faith, it's in a very real and tangible God, " Albo says, "one who loves much and forgives easily." Fitzgerald doesn't plan to slow down much in retirement. He will work in the diocese's archives, writing histories and biographies of priests, nuns and parishioners who have graced the Utah church. He will remain on several national boards and will give service wherever needed. He also will read more books and watch more movies. He won't be hiking, bowling or golfing. When the religious sisters gave Fitzgerald a going-away golf ball and a tee, it was a waste of money, Wester jokes. "They should have given it to me." The monsignor has always believed in having one leg in the present and another in the future. Without both, you lose your balance, he says. But it is time for younger priests to take over his role and help guide the diocese. As he ruminates about the arc of his career, Fitzgerald says it gave him joy even on the most difficult days. "I was with Bishop Federal when he died. I've buried religious sisters and friends with AIDS. I've seen the closing of the hospitals, the sale of St. Joseph Villa and many traumatic events." "But I'm a realist," he says. "You shed tears and then move on." Earned seminary degree from Mount Angel Seminary in St. Benedict, Ore. Oversaw Catholic Community Services of Utah in 1994-95. The Catholic Diocese of Salt Lake City has tapped the Rev. Colin F. Bircumshaw as its next vicar general. Bircumshaw, 61, is a Salt Lake City native, who was ordained in 1975 after completing studies in philosophy and theology at the Pontifical College Josephinum in Ohio, at St. John's University in New York and in Rome. He has been a pastor at parishes in Cedar City, Logan, Price and Ogden. He currently is pastor at St. Ann in South Salt Lake.